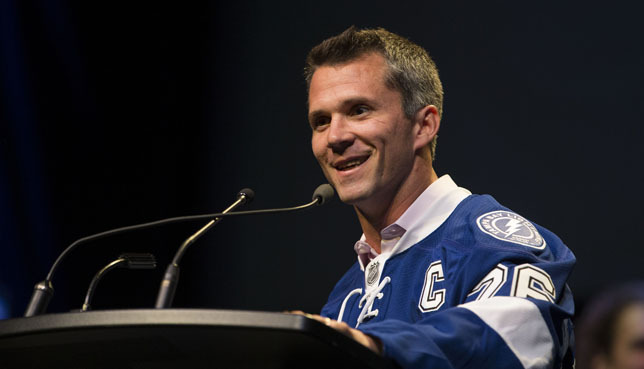 The Tampa Bay Lightning named forward Martin St. Louis the ninth captain in franchise history, head coach Jon Cooper announced tonight at an invitation-only event at the Mahaffey Theater in St. Petersburg. The three alternate captains will be defenseman Matt Carle as well as forwards Steven Stamkos and Nate Thompson. St. Louis, 38, is the Lightning’s all-time leader for points with 892, assists with 556 and shorthanded goals with 28. He ranks second for games played with 910, goals with 336, power-play goals with 87 and game-winning goals with 59. St. Louis is Tampa Bay’s all-time post-season leader with 63 games played, 33 goals, 35 assists, 68 points, 10 power-play goals, three shorthanded goals, eight game-winning goals and three overtime winners. St. Louis is the 9th player in franchise history to serve as team captain. Arguably his biggest overtime goal in the post-season came in one of the franchise’s most iconic moments. With the Lightning trailing the Calgary Flames three games to two in the best-of-seven 2004 Stanley Cup Final, at the cusp of elimination, St. Louis scored 33 seconds into double overtime to force a Game 7. The Bolts would go on to win Game 7, 2-1, to capture the franchise’s first Stanley Cup. St. Louis has filled his trophy case during his 13 years in Tampa Bay. He is six-time NHL All-Star, was awarded the Hart Trophy as the NHL’s Most Valuable Player in 2003-04 and is a two-time recipient of the Art Ross Trophy as the league’s top scorer. St. Louis is a three-time recipient of the Lady Byng Trophy for sportsmanship and was also honored with the 2003-04 Lester B. Pearson Award as the most outstanding player as voted on by the NHLPA, as well as the 2003-04 Plus/Minus Award for having the league’s highest plus/minus rating. The Laval, Quebec native is firmly entrenched in Tampa Bay. St. Louis joined the Lightning on July 31, 2000, signing as an undrafted free agent who had been playing in the Flames organization. He is heavily involved in the Lightning’s Score with Reading program, which incentivizes students and teachers for reaching certain milestones. St. Louis has also been involved in numerous other local charities. St. Louis has represented Canada in numerous international competitions, including the 2006 Winter Olympics, the World Cup of Hockey and the 2008 and 2009 IIHF World Championships. He was invited this summer to Canada’s Olympic Orientation Camp in preparation for the 2014 Winter Games in Sochi, Russia.